Belinda writes: I have a MacBook Air, almost one year old. Recently I switched from Mozilla Firefox to Safari. When I did that on some sites the fonts are really small. So I use Command + and – to make the fonts larger or smaller. But when I close the site out and then log back in, the fonts are small again. Do you know how to make the fonts stay the size I need them from site to site? Hi Belinda! There’s no Safari setting I know of that will “remember” custom font sizes for your favorite web sites, but there is a way to keep fonts on any web page from ever getting too tiny. Just choose a minimum font size in Safari from the drop-down menu, or type in a size of your own. Open Safari, click the Safari menu in the top-left corner of the page, select Preferences, then click the Advanced tab in the window that pops open. 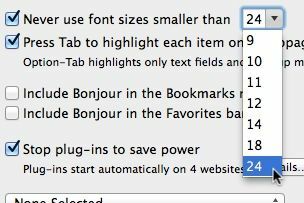 Check the box labeled “Never use font sizes smaller than,” then pick a size from the drop-down menu—anything from 9 to 24. You can also go ahead and type in any font size you wish. Now, visit any web page—and depending on the minimum font size you picked, the text on the page should immediately jump in size. Not happy with the result? (Yes, the results can get downright weird if you pick a large enough font.) Go back and tinker with the font size until you’re satisfied. Hope that helps, Belinda. Still have questions? Let me know!